I am creating a custom table cell view for my table view. After I connect an image view of custom cell (in storyboard) to my code in swift, I get the following error. Can you please tell me how to resolve this error? I add an exception breakpoint in my project. This is the line where it breaks. But I don't use 'image' in my code. You can use Introspection to find out whether object responds to a particular selector or not..
You have to pass indexPath to declare object of tableview cell. You can easily track such crashes using Exception Breakpoints. Once you add the Exception Breakpoint, option will be open to choose the Exception. Run the code and crash the application, breakpoint will stop you to the point where the code is crashing. Excellent! learnt something new in Xcode today. Very nice. When I've had this error, it's usually because I sent a message to an instance of Type A, when I was expecting Type B. In this specific scenario, you may not be satisfying a requirement of a parent class (given your instance of ItemTableViewCell most likely inherits). Can you maybe show us the code for your ItemTableViewCell class? Another possible reason is that the original object was destroyed and then another object was allocated at the same memory address. Then your code sends the message, thinking it still has a pointer to the old object, and Objective-C throws an exception because the new object doesn't understand that message. To diagnose this problem, run the Profiler with 'Zombies' detection. The first thing to ask is "Does this make any sense at all?" It may be that the named class has an Image method, but not an image method, and so the wrong method name was used on the call. Or it may be that the named method is someMethod:someParm:, but the class implements someMethod:someParm:anotherParm:, meaning that a parameter was omitted on the call. Most often, though, the named class does not have any method even vaguely resembling the named method, meaning that somehow a pointer to the wrong object was used in the failing call. because the object retrieved from myDictionary was, in fact, an NSDictionary, not the NSArray that was expected. Most confusing, unfortunately, is when this sort of error occurs deep in UI system code rather than in your own code. This can happen when you somehow passed the wrong object to a system interface, or perhaps configured the wrong class in Interface Builder or wherever. 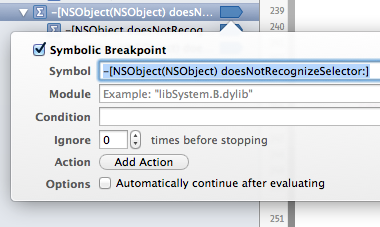 Try setting a symbolic breakpoint on -[NSObject(NSObject) doesNotRecognizeSelector:]. Just click [+] in the bottom left corner of the Breakpoint Navigator to add a breakpoint. Then click 'Add Symbolic Breakpoint'. Reproducing your crash now should give you a better idea where in your code the issue occurs. Could also just add an exception breakpoint. [SOLVED] Getting UITableView error "unable to dequeue a cell with identifier cell"